T.A. Barron grew up in Colorado ranch country and traveled widely as a Rhodes Scholar. Though he’d dreamed of becoming a writer, he couldn’t find anyone to publish his first novel. He joined a business, eventually became president, then decided to try again. So in 1989, he surprised his business partners by moving back to Colorado to become a writer and conservationist. Since then he has written over twenty highly acclaimed novels, children’s books, and nature books, many of which are international best sellers. He has won the Nautilus Award, given to books that inspire a better world, along with many honors from the American Library Association and the International Reading Association. His favorite pastime is hiking, camping, or skiing in Colorado with his family, which he does at every opportunity. Find maps and games at T.A. Barron’s website. Merlin — (1996-2010) Ages 9-12. Publisher: Spat out by the sea, the boy lay on the rocks, as still as death. Even if he survived the day, he had no home. No memory. And no name. So begins the tale of the strange young boy, who having washed up on the shores of ancient Wales, is determined to find his real home and his true name. One day he will become the greatest wizard of all time, but he knows nothing of this now. At the knee of the mysterious Branwen, who claims to be his mother, the boy learns lore of the Celts, Druids, and people even more ancient. Yet the secret of his identity seems always to escape him. To discover the truth, and the secret of his own powers, he runs away, voyaging to the mist-shrouded side of Fincayra, an enchanted land between earth and sky that is being destroyed by blight. It is there he discovers that the fate of this land and his quest are strangely entwined? 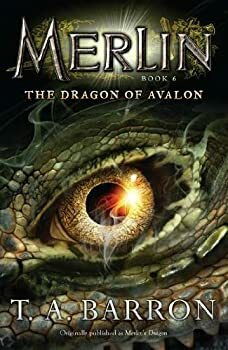 Combining all the passion, power, and spiritual depth that are T. A. Barron’s hallmarks, this book adds a thrilling new dimension to the legend of Merlin. Perhaps because it was a tad over-hyped for me, perhaps because since its publication there have been several other books and films that tell the story of Merlin's youth, but T.A. Barron's The Lost Years left me a little cold. I enjoyed it well enough, though certain segments dragged a little, but ultimately I think that much of its initial novelty has worn off. What was an innovative look at an unknown aspect of a legendary figure's life back in 1996 may feel like a somewhat generic fantasy-adventure by today's standards. "Pursue the Seven Songs in Turn; the Parts Beget the Whole..."
The second book in T.A. 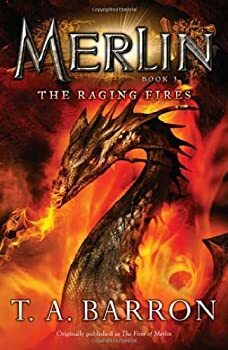 Barron's MERLIN SAGA (preceded by The Lost Years and followed by The Raging Fires) continues young Merlin's journey toward the powerful wizard of legend. Having noticed that there was very little literature that dealt with Merlin in his formative years, Barron set about writing a "prequel" of sorts to Arthurian legend that explored what Merlin was like as a child. In the first book Merlin discovers the identity of his parents and travels to his homeland Fincayra, an island that exists between the mortal and spirit world. "The Dragon Avenges His Dreams Yet Unhatched..."
The third book in T.A. 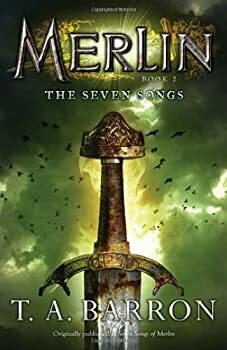 Barron's MERLIN SAGA, chronicling the adventures of the young wizard before his famous exploits in the Arthurian legends, continues on from The Lost Years and The Seven Songs of Merlin. Merlin has been reunited with his mother and sister on the magical island of Fincayra and is looking forward to continuing his learning in the magical arts. But it is not to be, for elsewhere on the island the ancient dragon Valdearg has awakened from his decades-long slumber to discover that his unhatched eggs have been destroyed -- and he's not happy. 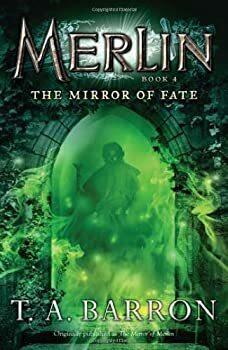 The Mirror of Fate is the fourth book in T.A. 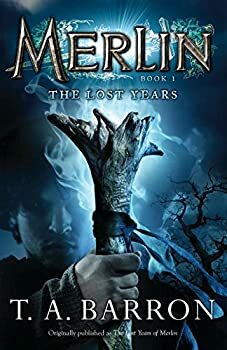 Barron's THE LOST YEARS OF MERLIN saga, chronicling the adventures and experiences of Merlin as a young man, long before Arthur's birth and Camelot's creation. Having discovered his true parentage and voyaged to his birthplace, the magical island of Fincayra, Merlin is now practicing and improving his magical abilities, helped along by several friends and family members. This is the fifth and final book of T.A. Barron’s THE LOST YEARS OF MERLIN cycle, one of the earliest literary explorations of the famous wizard’s childhood. Since then there have been a number of books (and one television show) about what this enigmatic sorcerer was like as a young boy, well before his mentoring of the famed King Arthur, but Barron’s take on the subject matter remains one of the most popular. So popular that it’s warranted a recent re-publication, with new cover art and tweaked titles. 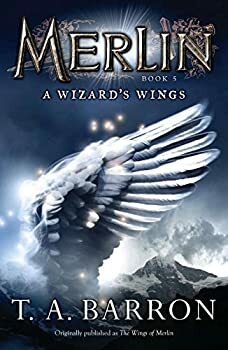 What was originally published as The Wings of Merlin is now called A Wizard’s Wings and the entire MERLIN collection — including its two spin-off series — has been repackaged as a twelve-book series. Recent republications of The Dragon of Avalon number it as the sixth instalment in T.A. Barron's MERLIN series. To be more accurate, it was published *after* the five-part LOST YEARS OF MERLIN and THE GREAT TREE OF AVALON trilogy, but is placed between them in the chronology of events. Confusing, right? Atlantis Saga — (2013-2016) Middle Grade, ages 10 and up. Publisher: From T.A. Barron, the New York Times bestselling author of the Merlin Saga, comes a new fantasy world about the origins of Atlantis, perfect for fans of The Lord of the Rings, Eragon, The Beyonders and Percy Jackson and the Olympians. In a magical land called Ellegandia, a young boy named Promi scrapes by, stealing pies, cakes and sweets to survive. But little does he know that his country is a pawn in an ages-old war between good and evil, battled both in the spirit realm and in the human world. Harboring secrets of his own, Promi teams up with a courageous girl named Atlanta and the two vow to save their land — and each other — no matter the cost. But their vow has greater repercussions than they ever could imagine — in fact, it may just bring about the creation of Atlantis, an island cut off from the rest of the world, where magic reigns supreme. With his trademark action, adventure, and poignancy,master of fantasy, T.A. Barron explores a new mythology — the origin of the legendary isle of Atlantis. This book is perfect for fans of Rick Riordan, Brandon Mull, Christopher Paolini and, of course, T. A. Barron’s Merlin Saga. 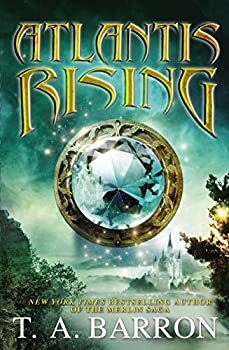 I gave Atlantis Rising by T.A. Barron a pretty fair shot I’d say—200 of its 370 pages, but eventually I just had to give it up. And I wasn’t alone in that, as my wife and 13-yr-old son gave up far, far quicker. As usual with books I didn’t care for, and especially for books I didn’t finish (a rarity for me), this will be a relatively short review, as I don’t like to belabor the point. The Heartlight Saga — (1990-1994) Ages 9-12. Publisher: A young girl must find her missing grandfather — and uncover the secret he harbors that could save Earth and the entire solar system from annihilation. Tree Girl — (2001) Ages 9-12. Publisher: Anna doesn’t know how she lost her mother. Or when. For as long as she can remember, she has lived in a lonely cottage by the sea with cranky old Mellwyn the fisherman. But Anna yearns to know more about her past and the mother she can barely recall. If only she could go to the far side of the forest where the High Willow stands — and where Mellwyn found her as a baby, years ago. Trouble is, the forest is haunted by deadly tree ghouls — the same ghouls who probably killed her mother! To solve the mystery of her shadowy past, Anna must face the ghouls themselves… and her own deepest fears. The Day the Stones Walked — (2007) Ages 9-12. Publisher: Pico’s father isn’t like the other fathers on Easter Island. Instead of building boats or hunting octopus, he sculpts the giant stone figures that he believes, in times of trouble, will rise and walk. Impossible, thinks Pico, until the Great Wave crashes into the island and Pico experiences firsthand the wonder of the stones. In this stunning tale of faith and the humbling power of nature, T. A. Barron and William Low envision life as it might have been on the mysterious Easter Island . . . before the stones became the island’s only inhabitants. CLICK HERE FOR MORE BY T.A. BARRON.